NBA – The Cleveland Cavaliers and Toronto Raptors square once again for Game 2 of their own semi-finals match best of seven series at Quickens Loans Arena in Cleveland. The Cavaliers dominated Game 1 from start to finish that lead to a blown out game and now looking to take an early 2 – 0 lead of the series while the Raptors looking to bounce back from a humiliating loss and hopefully tie the series before coming home in Toronto. In Game 2, the Cavaliers shows the more aggressive and more focus team taking an early double digit of the game 19 – 9 with 5:54 to go in the 1st quarter, Cavs up their lead to 13 points and ends up the quarter leading by 12 points, 34 – 22. At the start of the 2nd quarter Channing Frye hits a 3 point basket of a pass by LeBron James to give Cavs biggest lead of 15 points 37 – 22, Cavs keep their distance to Raptors as they maintain their double digit lead and duplicate their biggest lead of the half with less than a minute to go in the 2nd quarter. Cavs end the 1st half with a commanding 14 point lead 62 – 48. Cavs is also having a very good shooting night in three point area with 10 out of 15 in the 1st half. LeBron James lead his team in scoring at the half, with 19 points, 4 rebounds and 2 assist, Kyrie Irving added 7 points and 7 assist while Kevin Love posted 9 points and 5 rebounds. For the Raptors, surprisingly their center Jonas Valanciunas lead in scoring with 19 points, Kyle Lowry put 15 points while Demar DeRpzan only put 1 points. At the start of the 3rd quarter Cavs made a 4 straight points to increased their lead to 18 points keeping away the Raptors from coming back in the game and with 3:13 to go in the 3rd the Cavaliers posted their biggest lead of 24 points 97 – 73 after made free throws by LeBron James. James scores 15 points in the 3rd with a total points of 36 points in only 3 quarters surpassing his grand total points in Game 1 with 35 points. In the 4th quarter, Cavaliers posted their biggest lead of the game of 30 points after Frye hits a three of the side with 9:27 to go and with 6:07 to go in the last quarter James sit down after scoring 39 points, shooting 10 out 0f 14 from the field and 15 of 21 in the free throws. Raptors superstar Demar DeRozan held only into 5 points while Lowry added 20 point but suffered injury due to accidental collision with his team mates both stars did not return in the last quarter. 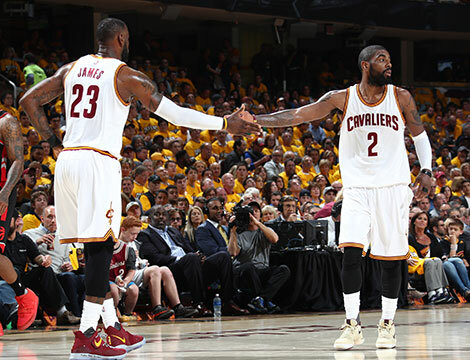 Cavaliers now takes 2 – 0 lead winning Game 2, 125 – 103. Meanwhile. LeBron James added another milestone of his career surpassing Kareem Abdul Jabbar for most point scores in Playoffs history, James is now chasing Michael Jordan for the number 1 spot for all time Playoff career points. No Comment to " CAVS Dominated Raptors in Game 2, Take 2 – 0 Lead in their Semis Match "